If you live in and around Delhi then you all must be roasting in the scorching heat for the past few days. Summer is generally a pleasant weather in most of the part of the world, but not when you live around the Oh so hot EQUATOR! Come to think of it, with every passing year, summer season brings more and more heat with it than the previous year. Now, what good can come out of it? Let’s put this heat to some use and make our conversation skills a little hot. आईए सीखते हैं ‘heat’ से related कुछ idioms और phrases. • Ron took the heat from the boss for his team’s mistake. • With the new plan rates, all the telecom companies have entered a dead heat. • If I don’t get this deal, I’ll definitely catch heat from my manager. • Kapil’s declaration of his relationship status on social media is now being considered as an attempt to take the heat off his fight with Sunil. • Hill stations are considered as the perfect holiday spots to beat the heat. • This kind of careless attitude heats me up. • The new CM’s radical decisions have heated up the whole state government system. • Their decision to get married was taken in the heat of the moment and now they are facing the bad consequences. 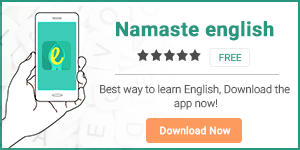 To improve your communication skills, download our apps HinKhoj and Namaste English. Next article‘Used To’ : How To Use It Correctly?